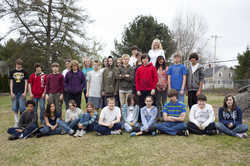 Our team is comprised of Surry Elementary School, the Surry Historical Society, and several Surry residents. Working together on this innovative project allowed us to utilize our skills and talents and to build on the collaboration put in place during our 2003 bicentennial celebration. This multi-faceted project has supported our school's continuing tradition of studying and sharing our town's culture and history. Leading up to Surry's 2003 bicentennial celebration, the entire school embarked on a three year study of Surry where students learned about our natural resources, geography and history. For several years, fifth graders hiked the the entire 23 mile coastline of Surry. One year, seventh graders researched the history of various sections of Surry, and then worked with Paula Mrozicki's third graders to write, produce and film a movie based on their research. Another time middle school students worked with teacher Elizabeth Ehrlenbach to research, create a sell a Surry history trivia game. Teachers, staff and students alike have been enthusiastic about all of these experiential activities, including this year's work on the Maine Memory Website. Project coordinator and teacher Lynn Bonsey has Surry roots reaching back several generations, which inspired her to help her middle level students discover how history relates to their lives and their community. 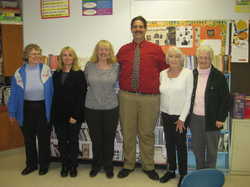 The Maine Community Heritage Project has proven to be a perfect fit for this little school. Established in the 1980s, the Surry Historical Society maintains an active presence in the community. 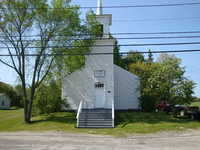 Surry's Old Town Hall, built around 1828, (and later moved to its present site on the Surry Road) houses its collections, including a detailed, handwritten twentieth century census, photographs, scrapbooks, and town records. During the warmer months, this treasured building, which has been placed on the registry of National Register of Historic Places, serves as a meeting place for our members and as a venue for several public events. Through the years, members have worked hard to keep the building in shape by painting it, making repairs, and keeping the grounds in shape. Our membership runs about 50 people, with two dozen or so actively involved. Working with the Surry Elementary School on the Maine Memory Network project has given us an unprecedented and unique opportunity to share our collections and memories with students and community members. We look forward to continuing this valuable collaboration.